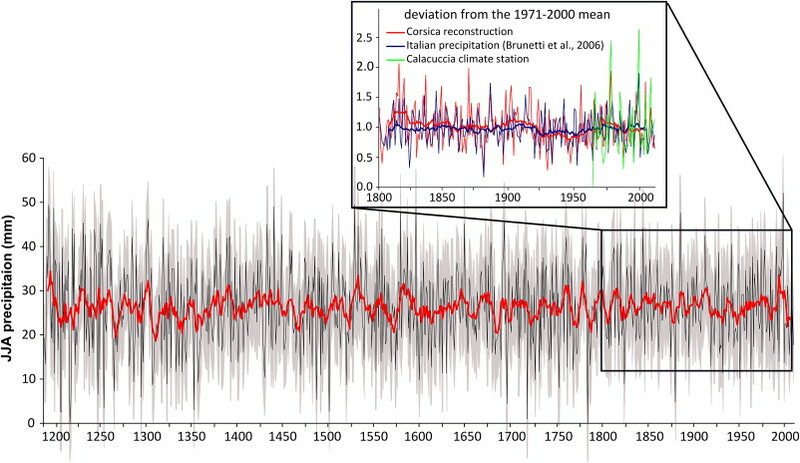 A new paper published in Quaternary Science Reviews reconstructs temperature and precipitation on the Mediterranean island of Corsica and finds no long-term trends or pronounced periods with extreme high or low precipitation over the past 815 years. Reconstructed temperatures also show relatively stable temperatures over the past 600 years with no evidence of a hockey stick in the 20th century. "No long-term trends or pronounced periods with extreme high/low precipitation are recorded in our reconstruction, indicating relatively stable moisture conditions over the entire time period." The paper joins over 1,000 other non-hockey-sticks worldwide published in the scientific literature and clearly rebuts alarmist claims of a "hockey stick" rise in temperature, precipitation, or increased extreme weather with extreme precipitation either wet or dry. Top 7 graphs show various non-hockey-stick tree-ring chronologies, d18O graph is a proxy of temperature and precipitation which shows a decline over the past 600 years, decreases in d13C are a proxy for the quantity of volcanic + anthropogenic CO2 in the atmosphere as volcanic & fossil-fuel CO2 is depleted in 13C. 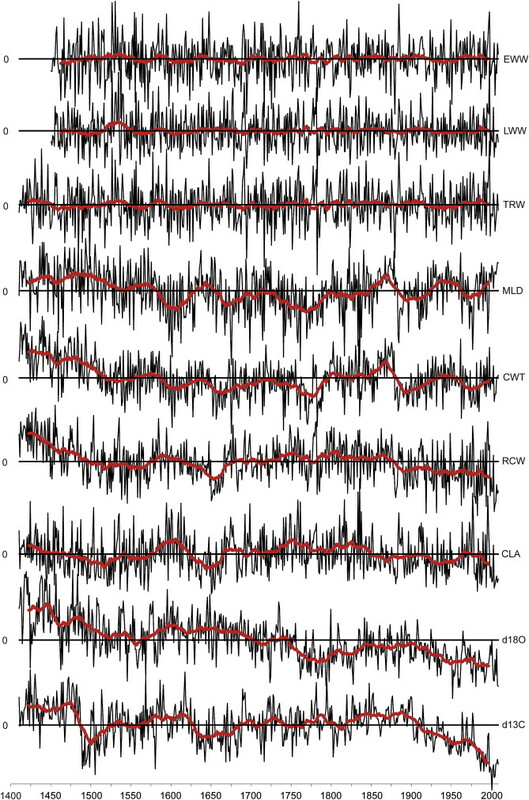 However, there's little doubt that Michael Mann could find a hockey stick in this data using his hockey-stick generating computer code, which also creates hockey sticks from Monte Carlo random numbers, baseball statistics, and telephone book numbers. We present a multi-parameter dataset from Pinus nigra. Isotope values and wood anatomical parameters are compared over 600 years. Carbon isotopes and tree-ring width are suitable for climate reconstructions. Summer temperature and precipitation is reconstructed back to AD 1450. Extreme climate conditions during summer influence cell parameter characteristics. We present a new multi-parameter dataset from Corsican black pine growing on the island of Corsica in the Western Mediterranean basin covering the period AD 1410–2008. Wood parameters measured include tree-ring width, latewood width, earlywood width, cell lumen area, cell width, cell wall thickness, modelled wood density, as well as stable carbon and oxygen isotopes. We evaluated the relationships between different parameters and determined the value of the dataset for climate reconstructions. Correlation analyses revealed that carbon isotope ratios are influenced by cell parameters determining cell size, whereas oxygen isotope ratios are influenced by cell parameters determining the amount of transportable water in the xylem. A summer (June to August) precipitation reconstruction dating back to AD 1185 was established based on tree-ring width. No long-term trends or pronounced periods with extreme high/low precipitation are recorded in our reconstruction, indicating relatively stable moisture conditions over the entire time period. By comparing the precipitation reconstruction with a summer temperature reconstruction derived from the carbon isotope chronologies, we identified summers with extreme climate conditions, i.e. warm-dry, warm-wet, cold-dry and cold-wet. Extreme climate conditions during summer months were found to influence cell parameter characteristics. Cold-wet summers promote the production of broad latewood composed of wide and thin-walled tracheids, while warm-wet summers promote the production of latewood with small thick-walled cells. The presented dataset emphasizes the potential of multi-parameter wood analysis from one tree species over long time scales.